SEBERANG PRAI: Datuk Seri Anwar Ibrahim questioned his former aide Ezam Mohd Noor’s intention in claiming that Anwar had been keeping the six boxes of government documents allegedly related to corrupt practices of high-ranking government officers and ministers. “After saying 10 years ago that he was in possession (of the documents), now during the Permatang Pauh by-election he said he has surrendered them to me. 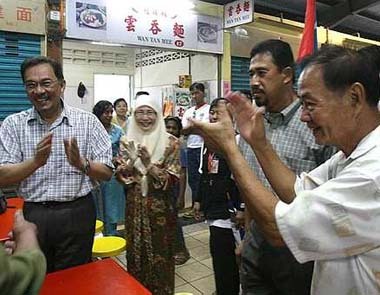 Do you take him seriously?” Anwar said during a visit to Seberang Jaya market yesterday. Ezam, the former PKR Youth chief who has rejoined Umno, said at a ceramah on Saturday night that he had passed the documents to Anwar and challenged his former boss to make public the documents. On another claim by Ezam that Anwar had handed out projects worth RM1 billion each to 15 bumiputera companies when he was deputy premier and finance minister, Anwar said Ezam should identify the beneficiaries of the projects and report the matter to relevant authorities.